Erik and I went to Asheville, NC specifically to train on hills while working on the east coast. Ironically, one of our West Coast friends Steve Miller just happened to be in town, so we started off with food and merriment at Limones! If you've never been to this little piece of heaven called Asheville, here's what you get: hiking, biking, rock climbing, zip lining, tubing, kayaking, camping, fishing, art, more art, high-end food and more high-end "foodie food," dozens of local craft breweries, eclectic shops and coffee shops, and that's just the tip of the iceberg. And there's always the scenic Blue Ridge Parkway, which was our target loop as our first bike ride in Asheville. Our intent was to loop from Tunnel Rd to to the BRP to Brevard Rd (191) back into town via Hayward (so we could eat like piglets again). We knew storms were coming in the afternoon so we took off early. I, for one, am a HUGE advocate for safe bike paths—paved and off the freeway—but you won't find that on the parkway. Our ride coming up on the PCH in June has me nervous as I'm a newbie "road cyclist" and let's face it, there are too many distracted drivers. So, the BRP was my first long-distance ride on the ROAD, with cars whizzing by at high speed. We got off to a great start with rolling climbs and just as I started to get comfortable on the road, we heard thunder and the sky ahead was black. 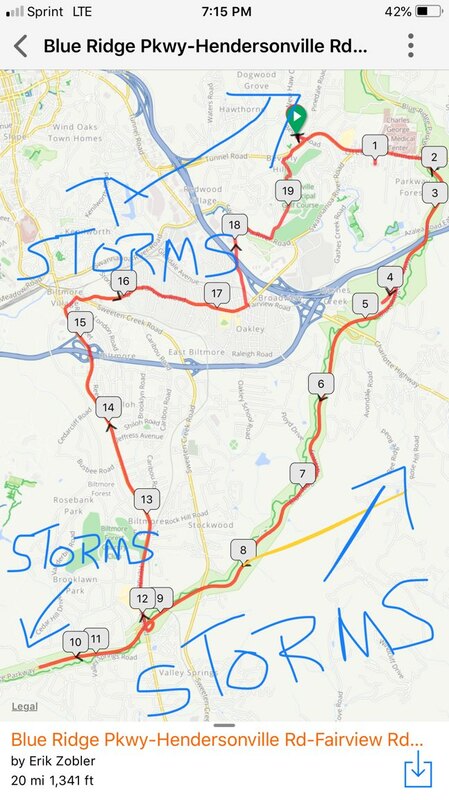 So we turned around and cut our loop short heading instead toward Biltmore Village (and places to dodge the storm). But there was a "crack" in the storm pattern according to our GPS, and we decided to ride through it, hoping we wouldn't have to stop our training. From Biltmore Village we cut across Fairview Rd and through a lovely golf course in an area—called, get this, Beverly Hills—and back to our destination. Not a drop on us! Our ride was only 20 miles instead of 40-plus, but 1) we were dry and alive (no lightning strikes or collisions with cars), 2) we were pretty beat up anyway from the climbs we DID take, 3) it gave us an excuse to eat another great meal at White Duck Taco before departing Asheville!